Sony UPX-C100 digital passport & ID photo system - PFS / Photo Finishers Supplies Inc.
Sony UPX-C100 SNAP-ID Digital Printing System is designed for passport and ID photo applications. This versatile system includes a digital still camera and a digital photo printer which are connected via a USB cable. The printer accommodates two different media sizes for the simple creation of Passports, I.D. cards, event photos, and other applications. The 5 mega pixel digital camera is simple to use and offers quick adjustments such as color and frame changes. The camera also has “Auto Review” which allows thecaptured image to be reviewed while still in Camera Mode (without having to switch to Playback Mode). The UPX-C100 SNAP-ID system uses Sony’s dye sublimation print technology so the results will be long-lasting and professional. 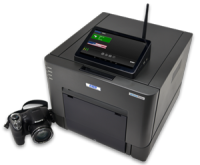 Printing with the UPX-C100 is a snap – there is no docking station – simply connect the USB cable to the camera and press Print. The camera can be powered either via the included AC power adaptor or 2 AA batteries. Auto Review allows images to be reviewed in Camera Mode. Easily adjust head & chin lines, or any of the preset frames to customize a print. Easy color adjustment to change hue, contrast, and tone. Three different print sizes and color/black & white options allow for versatile printing. USB connectivity provides fast data transfer.